How Do You Get Rid of Mould on Walls? Posted January 22nd, 2019 by pristine & filed under House Cleaning Services. Mould on the walls is not only unpleasant to look at, but can also cause a variety of health problems such as throat irritation, nasal congestion, chest tightness, and even skin irritation. Mould can start spreading on damp surfaces within 24 to 48 hours until it fills an entire corner and destroys the material it is growing on. Mould in homes primarily occurs in damp, dark and isolated spaces such as bathroom, kitchens and garages. High humidity levels also encourage mold growth, which is why it’s a good idea to keep your indoors humidity below 60 percent where possible and it’s often a bigger problem in spring and summer..
One way to control moisture in the house is to increase ventilation by keeping some of the doors or windows open for longer periods. Do this when the weather permits, and you will be able to stimulate cross-ventilation, which in turn promotes improved air flow that helps carry excess moisture and humidity out of your home. If there’s not much breeze outside, you can turn on the ceiling fans in each room to improve air flow, and use the exhaust fans in your kitchen to reduce excess moisture that is commonly generated when cooking dishes. Cleaning problem areas is also a way of prevention by combining some of our tips below with better air flow and ventilation you’ll be proactive rather than reactive. Before starting, you want to work out whether the material the mould has attached to can still be saved or not. 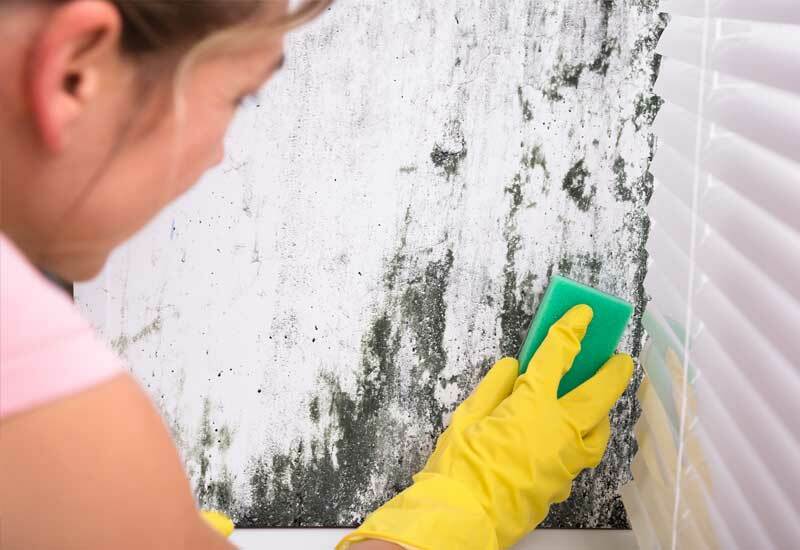 If the mould has taken root in super-porous materials such as furniture, clothing, and textile, then the easiest method to get rid of the mold is to throw away the infected objects. Don’t bother cleaning cardboard, wicker baskets, and carpets with dark green spots, just throw them away, as they can spread mold spores around the house. Files and books that have mold can either be left under the sun for a while, or thrown away completely to reduce the impact of the mold on your health. 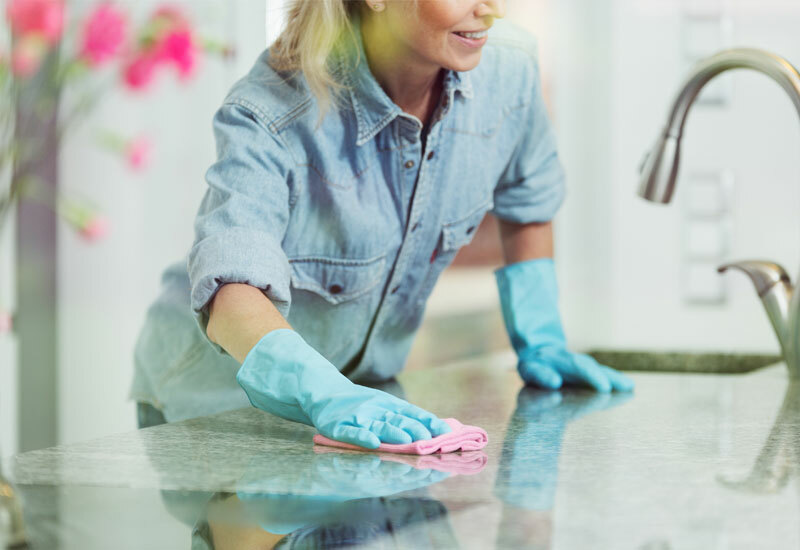 Non-porous surfaces like plastics, glass and tiles are relatively simpler to clean. But if you’ve got mold on tile grout, let us tell you now that can be almost impossible to remove it once it gets its grip in the grout or silicone in your bathroom. 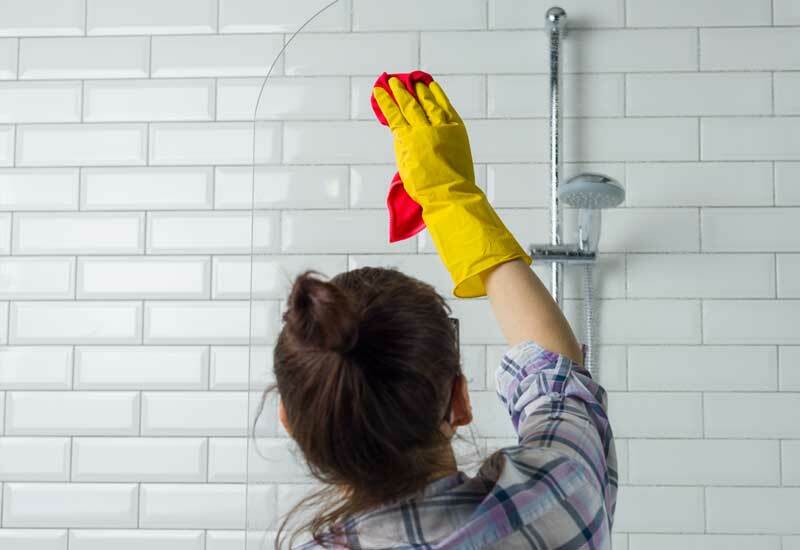 While you may be able to clean the surface of the grout, you cannot clean deep down to get rid of the tiny root hairs of the mold that can travel quickly all the way through the grout. Keep in mind that mold is harmful not only to your home but to you as well, so it pays to exercise caution when dealing with it, or better yet, have a professional cleaner handle the problem for you. Since they are equipped with the appropriate cleaning tools and solutions to treat the walls, you can save yourself the hassle of buying a petri dish kit from the hardware, which does not come with a guarantee that mold spores will stop spreading to other parts of your home. A word of caution before starting this task: mold can cause poor health, so if you are tackling a large area, it may be best to enlist the help of highly-trained cleaners who can take over the job for you. If you are removing mold from a smaller area, make sure to wear a face-mask, a protective eyewear, and gloves to avoid direct contact with the mold spores. 1. The first step is to vacuum up the mould using a HEPA vacuum cleaner that effectively removes at least 99.97% of settled dust and particles including mold spores that are about 3 to 100 microns in size. Vacuuming with a non-HEPA vacuum will not allow you to catch mold spores, which can pass through ordinary filters, and back into the air. Vinegar’s acidity makes it a great cleaning solution that can kill roughly 82% of mold species. To eradicate outbreaks of mold, spray white distilled vinegar onto the area, and let it sit for at least an hour so the mold can absorb the mild acid. Next, prepare three buckets filled with 80% vinegar and 20% water where you can dip a microfibre cloth for cleaning a patch of mould. The importance of using three buckets of this cleaning solution is to prevent cross-contamination by rinsing the microfibre cloth every time you work on one area of the wall. Microfibre cloth has far more fibers than normal cloth, so its sticking effect is magnified, and you are able to get even the microscopic dirt particles out of the wall. 3. After using microfibre cloth and vinegar to kill mold, there may still be discolourations on the wall that you can remove with bleach combined with good old scrubbing. Make a solution using three parts water and one part bleach, and use a scrub brush to thoroughly scrub the discoloration and streaks left on the walls. Once you have removed mold from the walls, the next thing to think about is how you can prevent it from growing back and damaging your most prized possessions. Any area in your house that has excess moisture is a potential home for this fungus, so the simplest way to inhibit mold growth is to eliminate any sources of moisture in your environment. If the mold is growing because of a leak, you will need to fix the immediate problem, whether it’s a plumbing or roof leak, before taking appropriate action for eradicating the mold. Similarly, if the mold is caused by condensation and humidity, you must reduce condensation first, before treating the mold on the wall. Mold damage is a serious problem, so if you want to ensure that it is eradicated completely, and does not pose any health risks to you and your family, hire a professional cleaning company that has the knowledge and experience necessary to take on the potentially hazardous task. One of the biggest issues with mold growth is remaining proactive and keeping on top of problem areas. At Pristine Home, we ensure that spores do not get into the air during the cleaning visit, and that the problem is addressed properly by removing the original cause of the mold. We will also advise you if any additional cleanup, like dust cleaning, is needed. By improving air circulation, you can combat mold growth and maintain a healthier environment for your family. By using our cleaners for regular cleaning of problem areas such as bathroom sinks, tiles, mirrors, walls and cupboards it will help you to address problems before the damage is too great to repair. While we all like to think that we can keep on top of our cleaning, with busy lifestyles it’s easy to lose control. Our regular cleaning services will allow you to regain time, keep on top of your cleaning and ensure that mold doesn’t damage your home. Get a quote in under 60 seconds using our online quote form and let us take control of mold in your home.